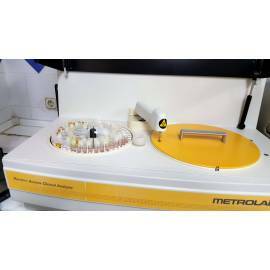 Biochemical analyzer 200 dilutions/hour. Tray reaction (80-column 1cm or 0.6 for beam of light). Arm takes a sample (5 positions). - Diluter (syringe 500uL). Photometer (double beam filters interferential 340, 405, 450, 505, 550, 600, 650, 700, 380 (or 750nm). Cleaning system, sensors, level and shock. PC (software Windows multitasking system XP). Temperature incubation 30-37ºC environment. 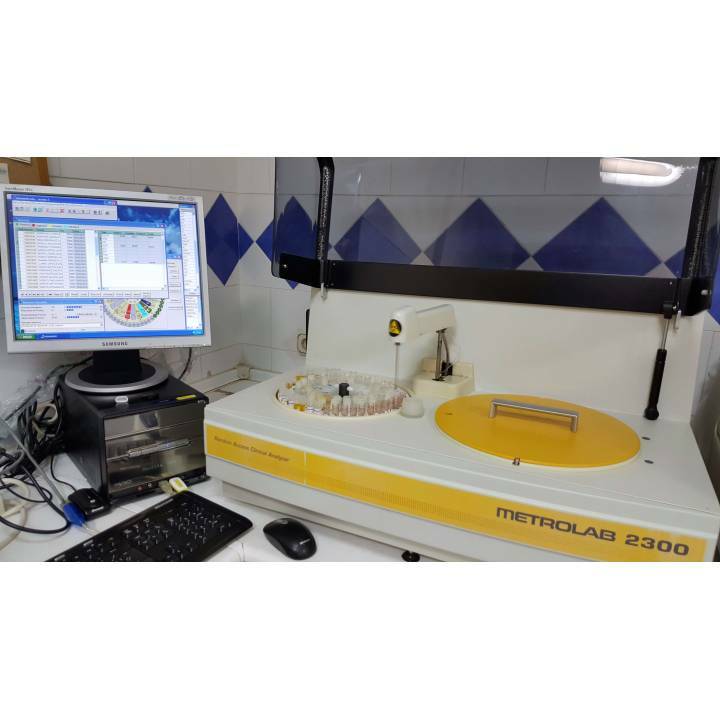 -Photometer double beam with filters interferential (340, 405, 450, 505, 550, 600, 650, 700, 380 (or 750nm). Supports 80 cuvettes of 1 cm or 0.6 cm of passage of light. Heater of incubation by hot air. 48 positions in the tray rotary. Working with primary tube. Accepts samples from microvolume pediatric. Volume of samples programmable to 100uL. 48 positions of reagents in the tray rotary. Quality Control: Diagrams of Levy Jennings. Rules of Westgard. Export and import data to other programs and/or remote terminals. Automatic protection back up. Computer: Pentium model or 64Mb. A minimum of Ram. 2-door RS 2322C, or 1 door RS232C serial and a PS2 MOuse. Color Monitor SVGA. Drives, CD ROM and floppy disk 31/2". Printer, 80-column or jet of ink. Level Sensor: Checks if there are reactive enough to all the action planned. Shock Sensor. If when descending the needle found mechanical impediment, it will stop and give you a visual warning and sound. Resuming the operation below. Cleaning. Pump programmed that it sends through the needle, a cleaning solution consisting of distilled water. Alarm system notifies you if one is about to exhaust the cleaning solution or if you are about to fill up the cargo container. 2.5 ml per determination about.